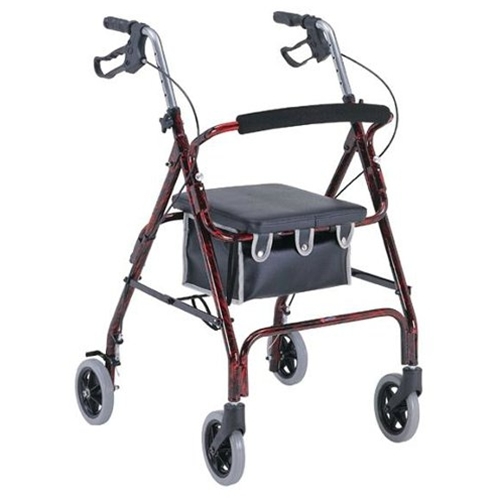 Merits 4 Wheeled Aluminum Rollator from HealthyKin.com features a lightweight aluminum frame and a vinyl pouch. Quick delivery. I use it every day. No assembly needed. Very useful. Good price. This is my second walker from you. Love it and love the improvements you have made since I purchased my first one ten years ago. Great price...very light weight..easy to handle. I ordered this for my 87 year old father. I looked everywhere to replace his old one. (The brake broke after a few years use) he wanted the same one he liked it so much. He liked the fact that the brakes had the features to solidly “lock it in place”. It is lightweight and easy for me to lift into the trunk. Delivery was fast and easy to assemble!